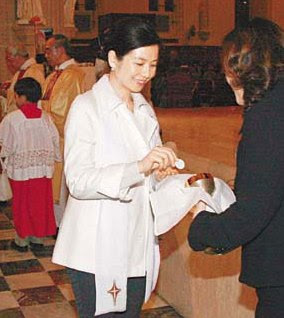 I'll admit that a part of me finds it distasteful that someone took film inside a church as Cherie Chung was baptized a Catholic. I say that, though, as a devout atheist who can recall a time when he had a sense of the sacred. Aren't some things just off-limits for cellphone-picture-taking? Shouldn't they be? I think what is weirder for me is seeing the legendary actress driving herself away from the church service. Somehow I picture stars of Cherie's status having staff do that sort of thing -- is she out of money or something? According to the the HKMDB News translation, she denies a return to film for financial reasons. Looking at these pictures, I am reminded of how I used to be utterly fascinated by Grace Kelly: she never took a bad picture; she was feminine grace with the name Grace; she was a talented actress who became more than just a pretty face; she became royalty of a sort. 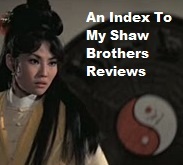 Hong Kong continues to crank out starlets who make Ah Sa and Ah Gil look like pretty graceful and talented in comparison but the days of the legendary beauties, like Cherie, are perhaps over. There's no more sense of the sacred and neither is there a sense of much glamour anymore, I'm afraid.